Perfect for when you don't want to carry a purse but you need a place to store your ID and cash. 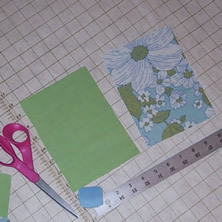 This is also a great project for leftover scraps of fabric that are too small for anything else. 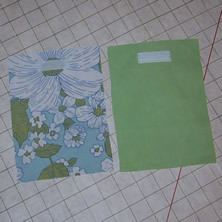 Cut two 5.5" by 7.5" rectangles -- one out of outer fabric and one out of lining. 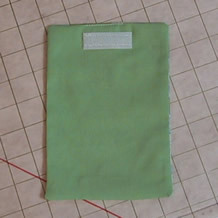 Sew a piece of velcro to the right side of the lining 1/2" down. Sew the other piece of velcro to the right side of the fabric 1/2" down. Place the two pieces right sides together with the velcro at opposite ends and stitch almost all the way around about a 1/4" away from the edge. Leave about an inch unsewn. 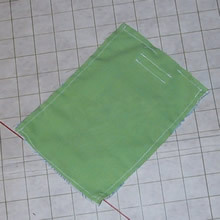 Turn right-side out; iron flat, and stitch up the 1" open part. Now you'll have a rectangle with no showing seams. 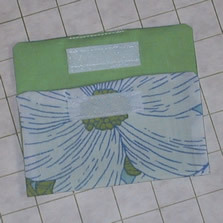 Now fold the rectangle up, iron it, and stitch up the two side seams to form a pouch. Iron the flap down to form a crease. 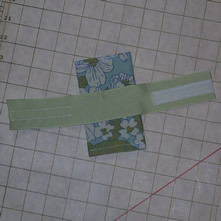 For the arm-band part, you can use a wide ribbon like I did or sew a matching arm-band out of your fabric and/or liner. 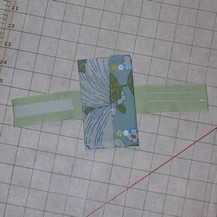 To figure out how long to make it, measure the part of your arm you'll wear this on and add about 1.5". 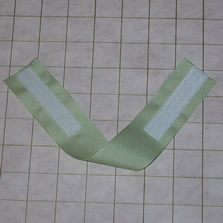 Then just stitch on some velcro -- one piece on each end of the band on opposite sides. Now just stitch the pouch onto the ribbon as shown. I also decorated the pouch with some sequins and beads. That is totally cute. I think it would make a really great gift too...thanks for sharing the instructions! these are rockin'! What a great idea...and cute fabric too! Soapers, Join me at the Whisk! www.the-whisk.us best soaping forum...EVER! WOw, there would make a great Christmas gift! Thanks for the instructions! http://quetaknits.wordpress.com/ - My knit/crochet blog! http://geetargeek.livejournal.com/ - Friends-only, so add me! that is adorable, i love it. Fab project! I love the fabric you used. It looks just like an old pillowcase that my grandma had (I turned it into a skirt). Pillowcases have a multitude of uses. Nice! Thanks for the instructions! thats a great idea! i love the fabric too. thats really cute. you could make a few in different fabrics so you had one for every outfit! just a question, would you interface the fabric to make it stronger? I can't wait to try this! I think it is good for anyone who goes to the gym and needs a pocket! Thanks for the instructions! Intarsia knitting AND Parallel parking, same week -- I'm on fire!